The Sovereign’s Sceptre features the 530.2 carat Cullinan I diamond, which can be removed and worn as a brooch. Photo courtesy of Alan Jobbins. All eyes were on Britain in July 2013 as the world eagerly awaited the arrival of the newest British royal. The first child of the Duke and Duchess of Cambridge – a boy – was born July 22, 2013, and is third in-line for the throne. He will inherit a rich legacy and perhaps wear some of the most prized, historical jewels of the royal realm. The six pieces described below are part of the Royal Collection, held in trust by Her Majesty Queen Elizabeth II for her successors and the nation, or the personal property of Queen Elizabeth II. These gems are not only beautiful, but have a rich history and distinct gemological allure. The crown of Queen Elizabeth, the queen mother, features the famous 105.6 carat Koh-I-Noor diamond, which came to Queen Victoria in 1850 from Duleep Singh, the last Maharaja of the Sikh Empire. It became a part of the Crown Jewels in 1877. “Also known as the Mountain of Light, legend said that the owner of the Koh-I-Noor ruled the world. Others believed that any man who wore it would be cursed,” said Dona Dirlam, director of GIA’s Richard T. Liddicoat Gemological Library. The Imperial State Crown features the Black Prince’s Ruby, which is actually a different gem – a red spinel. “In ancient times, the mines of central and southeast Asia yielded exceptionally large spinel crystals. These fine stones became known as Balas rubies, and some of them were the treasured property of kings and emperors, often passing through many hands as spoils of war. As a result, some of the world’s most illustrious “rubies” are actually spinel,” said Russell Shor, GIA’s senior industry analyst. The cross at the top of the crown is set with a stone known as St. Edward's Sapphire, taken from Edward the Confessor’s (11th c.) ring or coronet. The famous 317.4 carat Cullinan II diamond, or Lesser Star of Africa, is set on the front, while the back band contains the 104 carat Stuart Sapphire (17th c.). 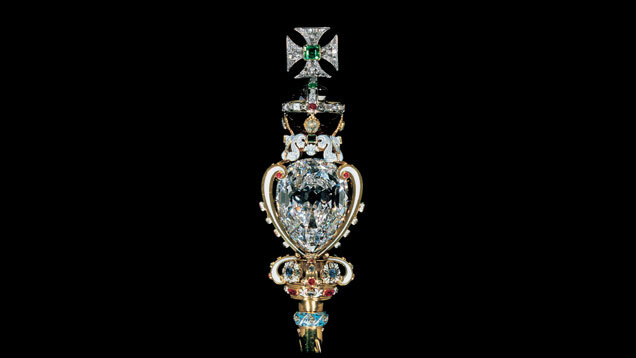 The Sovereign’s Sceptre, originally made for the coronation of King Charles II in 1661, was redesigned in 1910 after the discovery of the Cullinan Diamond, and set with the 530.2 carat Cullinan I, known as the Great Star of Africa. The Cullinan I can be removed from the Sovereign’s Sceptre and worn as a brooch. The diamond and platinum tiara features a prominent scroll motif and was made in the “Halo” style, which was popularized by Cartier to suit the softer hairstyles of the 1930s. Platinum was a popular metal during this period until the outbreak of World War II. The tiara was given to Princess Elizabeth on her 18th birthday, and most notably loaned to the Duchess of Cambridge on her wedding day in 2011. Queen Adelaide’s Fringe Necklace has been in the queen’s possession since 2002. “This is a versatile piece, much like many other pieces in the royal collection, and has been worn as a necklace, a border to a dress and a crown,” said Larry Larson, GIA trend expert. The piece, originally created by Rundell using diamonds removed from various pieces of George III’s and Queen Charlotte’s jewelry and insignia, has been worn by British queens since 1831. Queen Victoria lost significant pieces of the family jewels that she considered her own in 1857 due to succession laws of the time. This included her grandmother’s (Queen Charlotte) diamond necklace and earrings. Garrard, the official crown jeweler at the time, was ordered to replace the lost jewels by taking stones from swords and other “useless things” in the queen’s collection. The original 26 total stones in the necklace – nine between 8.25 and 11.25 carats – were taken from a Garter badge and sword hilt. A favorite of Queen Victoria, the necklace was also worn at the coronations of Queens Alexandra; Mary; Elizabeth, the queen mother; and Queen Elizabeth II. Laser and X-ray scanning was used to create a model of the historic Koh-i-Noor diamond, the centerpiece of the Queen Mother's crown.